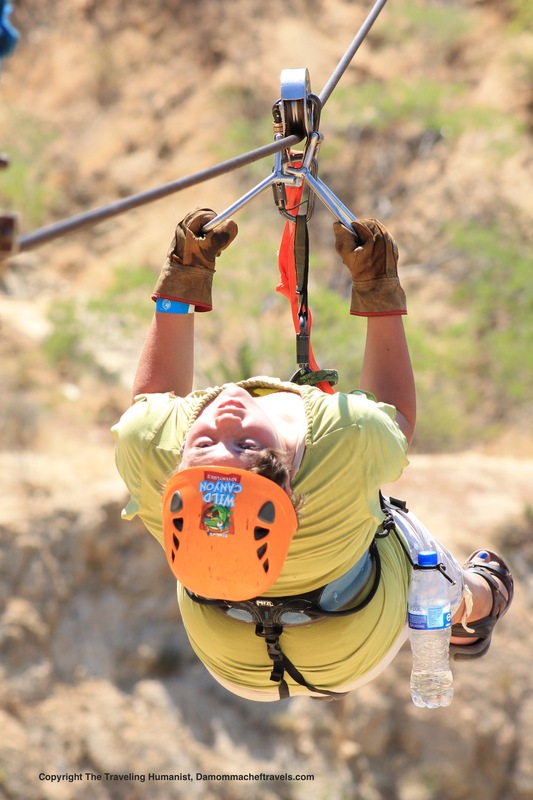 One of the many activities we enjoyed while in Mexico was ziplining. 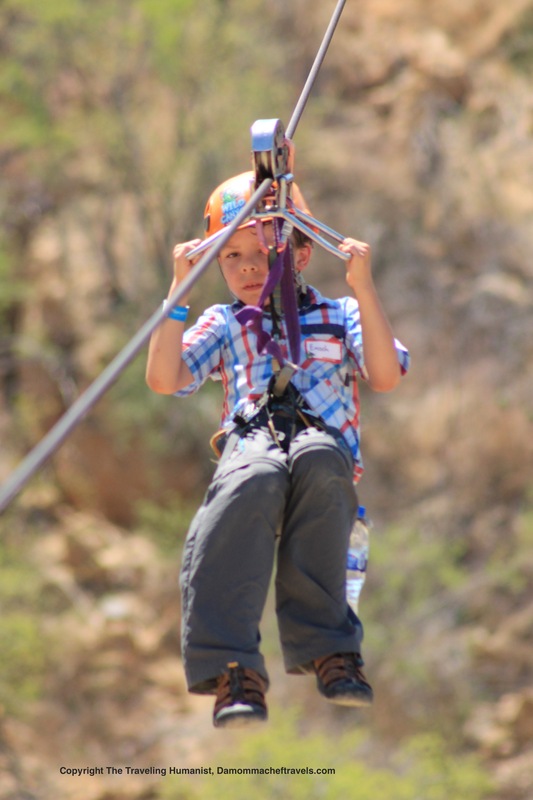 We have been ziplining before in Hawaii, and had a great time, but now that I have compared the two adventures I can say that the ziplines in Hawaii were definitely less adventurous. The harnesses were bigger and more supportive, the lines not nearly as long, and the speeds we got were fun but not super impressive. 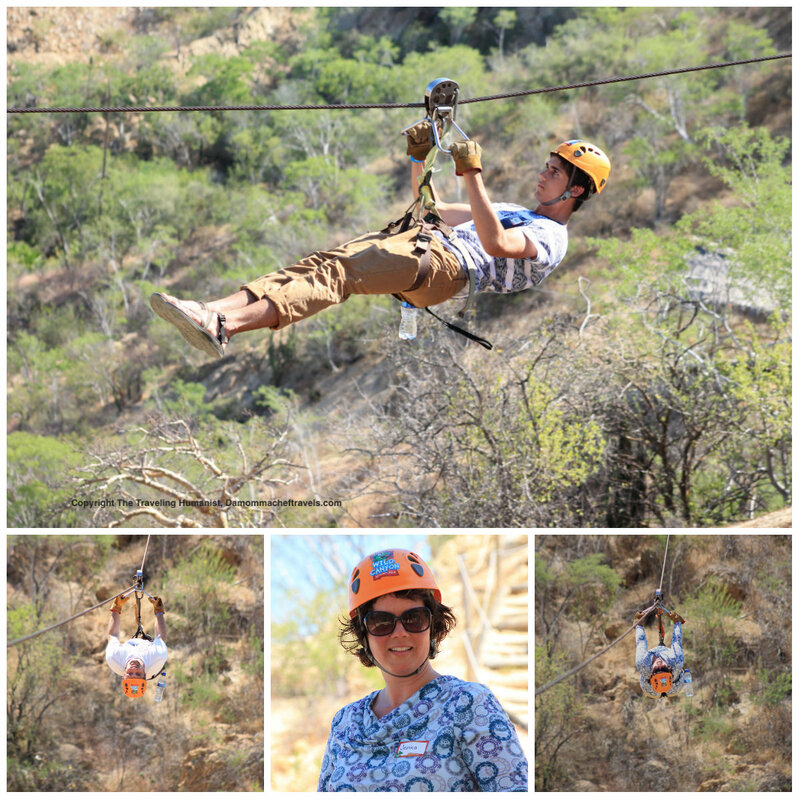 In Cabo, however, with Wild Canyon EkoPark , the zipline tour was really something! The lines were so long (some over half a mile) and on some lines we got to outrageous speeds. Plus, they allowed tandem ziplining so I got to go on several of the lines with my 11 year old daughter, who was a bit nervous about it all. The desert canyon was green and beautiful, although I must admit I didn’t look down as much as I could have because it was pretty nerve wracking! The tour was about two and a half hours, with quite a bit of hiking in between line locations. They kept us hydrated, but this is not an activity you would want to do in the afternoon or during the hottest season. We were all happy to head back to the showers and pools of Esperanza. For these ziplines you have to brake yourself, if necessary, by twisting your mechanism back and forth. Most of the lines we went facing forward but one we went backwards with our heads tilted back. Also, several of us would lose speed towards the end and have to pull ourselves back to the station. It made me feel very “Indiana Jones” adventurous. I am so brave including this sweaty picture of myself! My daughter had never done anything like this before, and it was great at first because we were able to go tandem on the lines at the beginning of the tour, which you do so by linking together in a line, with her feet tucked under my arms by my side. One of the last lines was half a mile long, very high up, and you could only go by yourself. I was pretty nervous for her but she made it all the way and acted like a cool cat who had been doing it forever. The youngest in our party (my nephew) barely made the age, weight, and height requirements. He was so brave though! He was light enough that a few times he was just short of making it to the station, requiring one of the guides to go get him. But that is a very common occurrence! 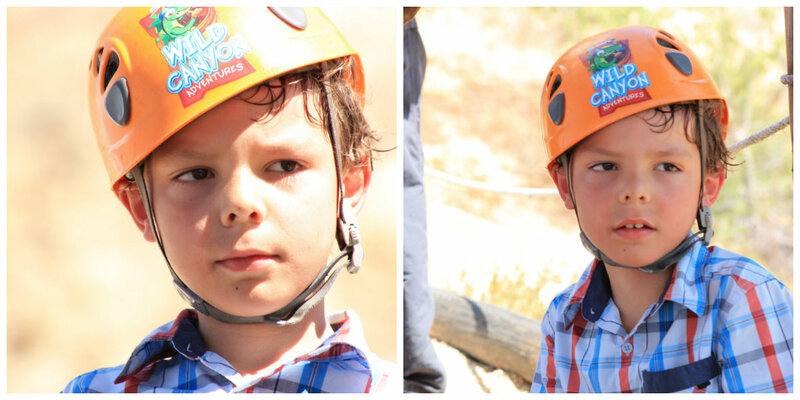 So there he was–dangling far above the canyon floor–being so brave. He was great! The tour includes transportation from the resort, and there is a cafe that serves some delicious pina coladas and guacamole you could enjoy after your adventures. All in all they tour was very organized and well done. The only downside was the extreme temperature–climbing close to 100 even though we booked the morning tour. I don’t know if I will ever feel the need to go ziplining again, though. It was pretty fun, but when we go on these more “Adventurous” vacations, I think scuba-diving is enough adventure for me! Even though this tour did not include bridges and rock-climbing like other tours, you still have to be in decent shape to maneuver all the hiking in between stations–a lot of it uphill. I was very grateful a lot of my summer workout had included uphill walking! I was very hot, but even this plump 41 year old mom of four was able to harness the spirit of adventure. Great sharing. Enoch I am sure will be very excited to be featured in your article. Love you lots. It is great that there are so many things for children to get up to while they are on holiday, it is so important to give children the opportunity to travel. I agree! Even better if you can manage to start traveling when they are young so they become used to trying new foods and look forward to adventures.